You should be able to get a 190 Montauk with a 150 HP engine near that price [$42,000], I'd think. Especially with boat show pricing. Beefy looking trailer, too--is it aluminum? That 270 Dauntless is a nice boat! The 270 Dauntless is our grail boat, but we're going to stick with our Montauk for a few more years. More pics, please. I just called my bank to see if I had $10MM in my account and they laughed at me and hung up. I think I'll keep my yacht expenses in the sub-28' Whaler category for now! You should save this link, just in case that lottery ticket comes through. I have a 5.2 Harpoon, and decent models seem to go for about $2,000 with trailer. 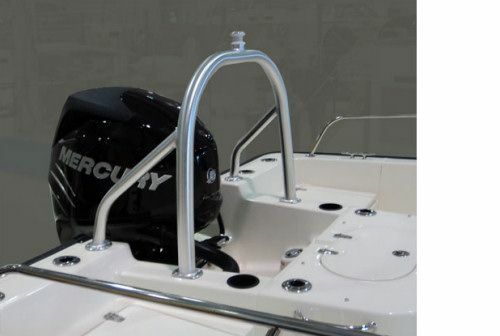 Like Butch, we don't have bow railings on our 190 Montauk. I've never been on the boat and thought "I wish we had railings". But, I can see what you mean - having short railings would probably look good! Phil - do you have one of those Turbo Swings? Looks like a great option for me as well. I was looking at the Whaler tow arch, but it wouldn't allow me to use the boat cover that I have now. I think this Turbo Swing would. You are all going to be right down the road from Beacon Marine. Maybe Sue will bring down a nice cooler full of beer for you! 190 Montuak has nice, big self-bailing drains. Given that the bilge pump draws little power, I'd think a solar charger would do the trick, despite overcast weather. Or, put the boat on a lift or a floating dock--maybe. Congrats! Someday, we'll take a look at one, as it's probably the best boat for our family. Per Karavan, if you use a cotter pin, the grease may short circuit and not get pushed to the inner bearing. But, that only matters when pumping grease, so I guess I’ll pump grease with a 5/32 section of rod, then replace with a cotter pin when done. mobroy - did you end up buying this Dauntless? My 2017 had the aft seating as an option and the backrests slide into the rod holders. In 2017, the seat bottoms don't fold up, though, so that's a nice improvement. But I really like the bow storage (fishbox), as we are always looking for more room to store things. I'm thinking about getting a console cover since we'll be slipping our 190 Montauk for a week or so coming up. Besides Wm. J. Mills & Co., is there another supplier I should consider? Well that sounds like a fantastic deal to me, then. 30% off MSRP. There are a few used 2015/2016s for that price. I'd jump on that in a heart beat. Yes - my trailer has 4 disc brakes. I also use an IR thermometer during long trips for peace of mind. Butch - I only have analog gauges, so I'm looking for more information from the engine. Trim would be interesting to me, too. Right - I'm not sure hers are at C1. I was giving that as an example on how that drawing isn't so great, as it really doesn't give you enough data to accurately locate C1, if you wanted to locate that area. I think her cleat is located aft of C1. Her's were not factory options, per my understanding. Thanks Butch. Whaler's tow arch looks like this. I was quoted $710.